Sacrilege, a recreation of the Stonehenge. Sacrilege is another work of art and ingenuity featured in the Sydney Festival 2014. 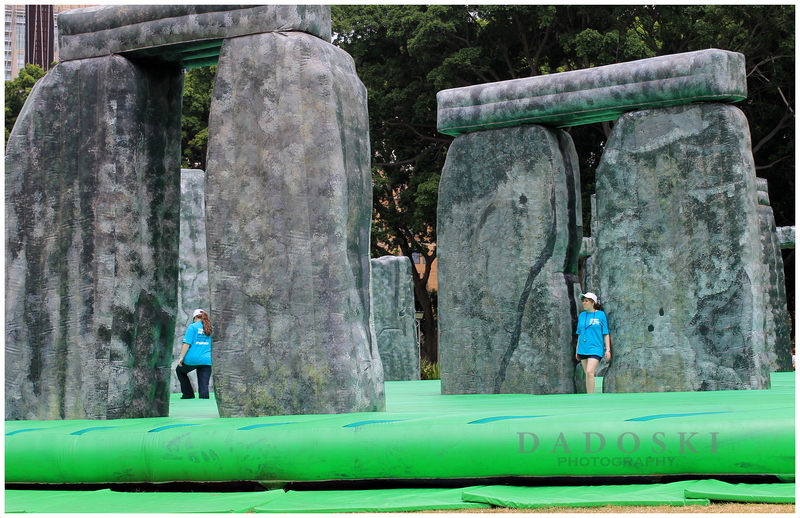 It revives the monumental Stonehenge, a prehistoric monument in Wiltshire, England but this time to be enjoyed by the young and old, recreated as a life-size inflatable castle– with everyone invited to have a bounce, free. When we were here last Sunday, a long queue of interested people, young and old who would like to try to bounce into it was already formed and the time was getting close to noon time yet the entry point was still close. Because of this queue and like other people who can’t wait, we decided to just take pictures of it, not bad anyway since no kids yet were on the run bouncing up and down except for those guys in charge of the fun going around of it, perhaps checking out if inflation is well up for enjoyment. Another piece of art from history. This is a new work by Turner Prize-winning artist Jeremy Deller has become a contemporary art feel-good hit, a family friendly collision of history and art, and just like the Luminarium, it’s another piece of art that can be enjoyed by everyone. 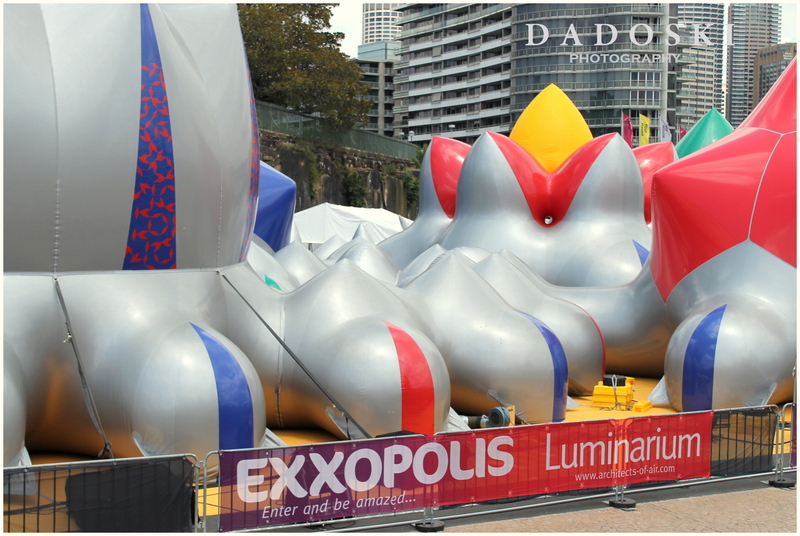 Exxopolis is the title given to this massive inflatable sculpture which is the most recent creation from the world renowned U.K. based designers of inflatable walk-in sculptures, Architects of Air. 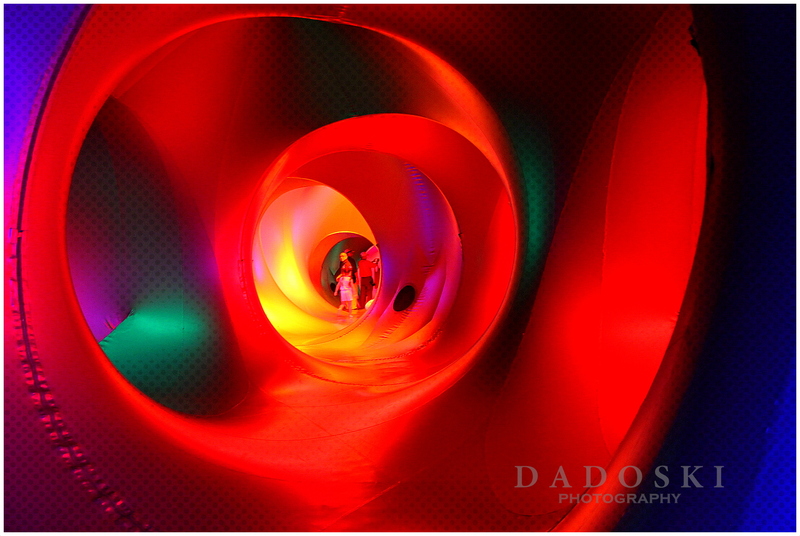 We were one of the many enthusiasts or people who were curious to know what’s inside this Luminarium. 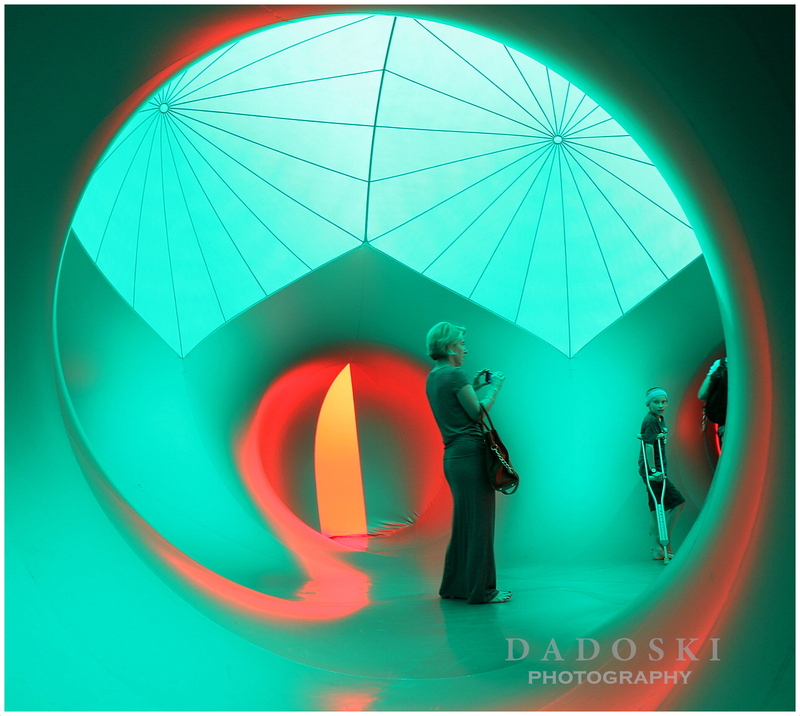 Luminairum is the name given by the Architects of Air to this inflatable structure that consists of a maze of tunnels and spacious domes that contain light. Because it’s summer time, some air conditioning equipment kept it up to a temperature tolerable inside this sculpture. There was a long queue and it took us about almost an hour until we were called to get in. Right at the first gate a lady explained to us what the inflatable maze is all about and told us to enjoy the sculpture and that we have twenty minutes to do so. The first sight we came into is indeed surprisingly awesome – different colors blended or resonated into an enchanted color of light to the astonishment of the people. As we went further inside, we arrived at a bigger dome they call “Cupola” which is the centre piece, very spacious that you can lie down, and enjoy. That was definitely a creation unique in style because people felt the sense of wonders, how they transform faces and clothing, some explored the maze immersing them in radiant color. From the ladies story, the sculpture has a span of 53m in length and nearly nine metres in height, and occupies a space the size of half a football field and is constructed using 3,000 square meters of plastic in 9,000 different pieces joined by six kilometers of seams. Originally, it took 55 people six months to build, yet can be erected in as little as four hours and inflated in just 20 minutes. Imagine that … amazing, right? Another form of colours, to the delight of the people. 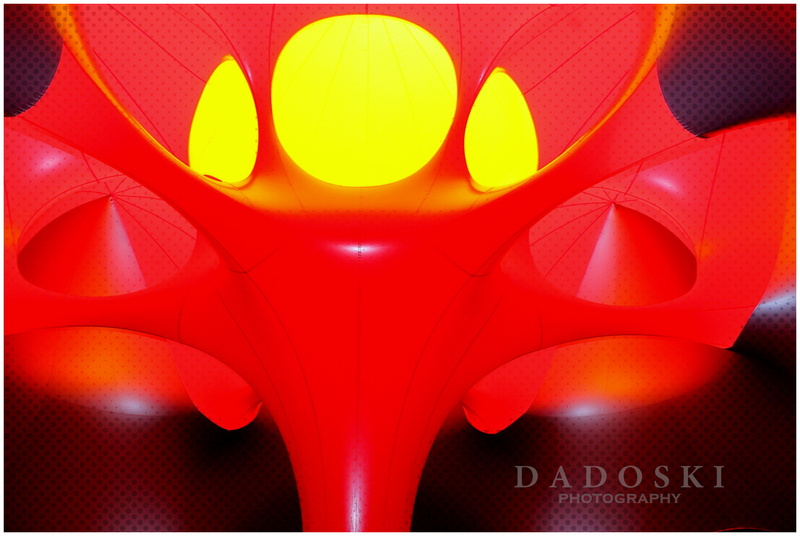 The Luminarium is the attraction at the foreground of the Opera House in Sydney and will be there until the end of the Sydney Festival, January 27. Marked at the gate of the museum. Last Sunday, the 12th of January 2014 we passed by this unique world heritage on our way to Circular Quay from the Hyde Park where some shows for the Sydney Festival 2014 were on progress, visited some actually. The buildings attracted my attention and came to knew as such when some guys were having some photos at the gate. 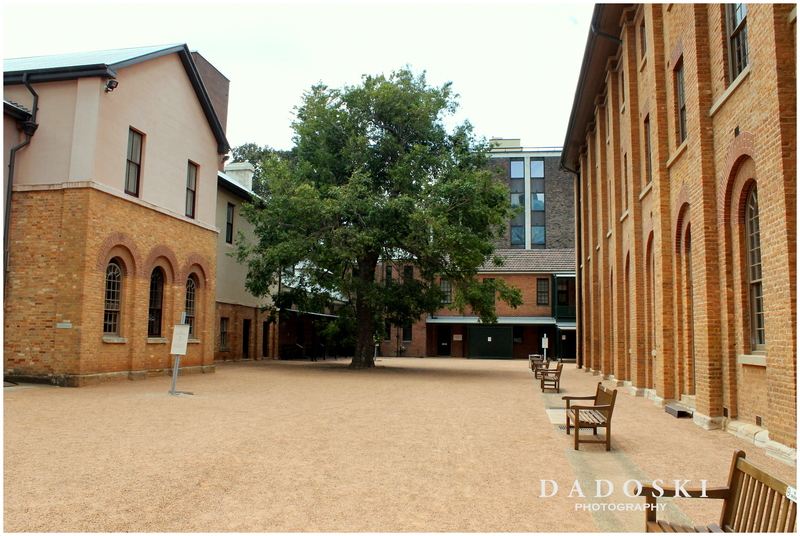 I discovered further that it was a barracks of convicts where thousands of them during the 1819 to 1848 had lived. It was not actually our intention to be here and so I did just take some photos of it. Taken at the museum’s compound. 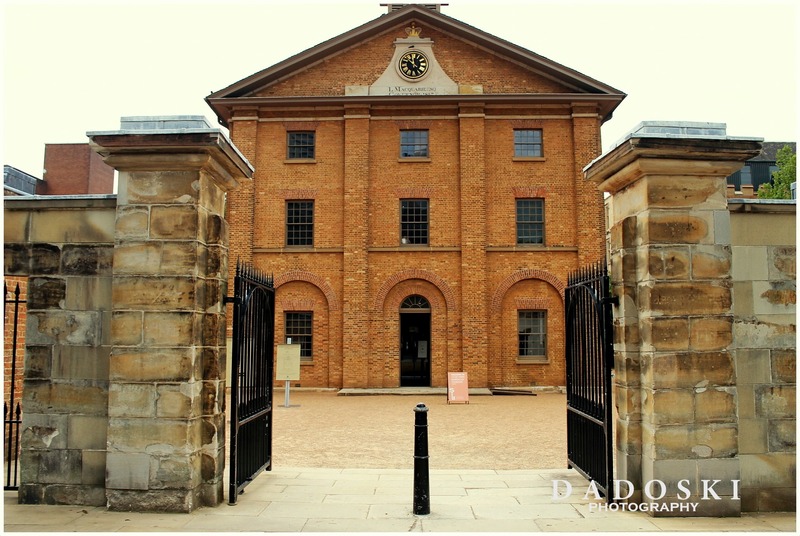 Today, I’ve learnt from their website that it is one of the most significant secular buildings surviving from Australia’s colonial development and it was the first convict barrack in the colony. 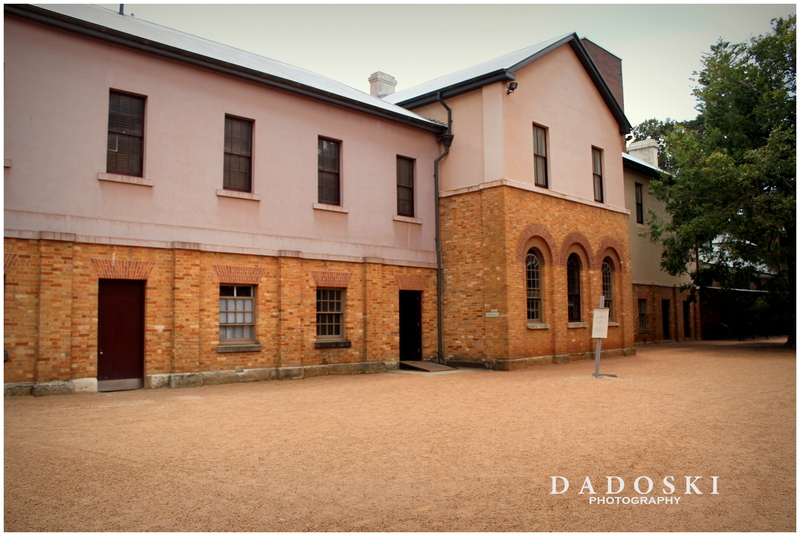 According to their guidebook, the Hyde Park Barracks Museum displays evidence of the thousands of men and women who lived and worked here during its 190 year history. A diverse and colourful history is revealed in the personal histories and recollections of the Barracks’ occupants and through pictures, documents, artefacts, objects, soundscapes and the fabric and rooms of the building itself. Unique buildings built by convicts. The buildings are one of the finest works of the accomplished colonial architect, Francis Greenway, who was himself a convict. Here is the link that treasures its wealth of history, should you wish to know more about the museum just click the link. The gate to the Barrack’s Museum.